Phantom's Viewpoint retractable screens provide smooth, quiet and safe operation, bringing fresh air into your home while keeping the insects out. Used on both left and right hand doors, the decorative pleated mesh provides good visibility when in use, restoring your view without obstruction when not needed. Available in white finish only. The kit includes all hardware and instructions for installation. Stanley's Retro Collection of steel doors is definitely style-driven. These doors' retro style is both classic and current, while their performance is at a level that only a Stanley Door could provide. Their enhanced door lite frame adds an Art Deco appeal and further lends to their retro feel. If you consider yourself on-trend or design-oriented, this Grain patterned glass is for you. Its Art Deco feel will create a stand out entrance for your home. With a high level of privacy and the ability to let in just the right amount of light, this glass model is sure to please. Actual colours and appearance may vary slightly from image due to lighting. This sturdy steel 2 panel pre-hung entry door comes with a clear glass single hung window and screen. ENERGY STAR certified and double bored, this 36 in x 80 in door can accept a lock set and deadbolt of your choice. PLEASE ALLOW 2-3 WEEKS FOR DELIVERY AS THE DOOR IS CUSTOM MADE. 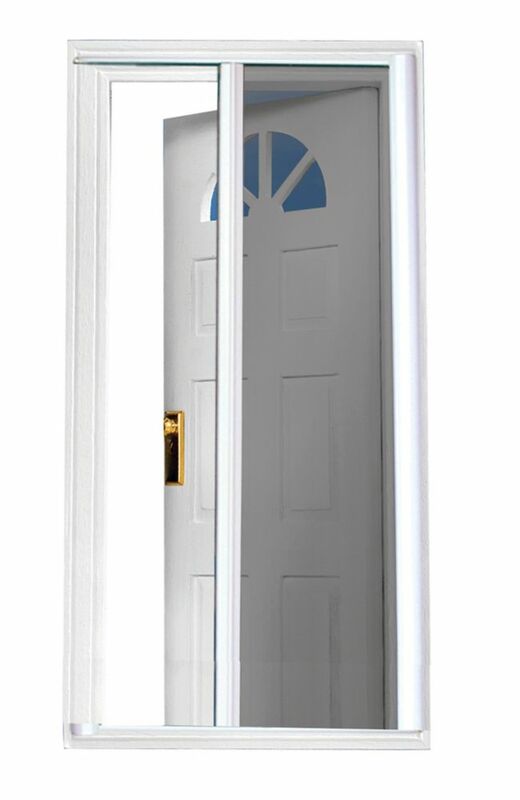 81.5-inch SeasonGuard White Retractable Screen Door (Standard Doors 79-inches to 80.5-inches) is rated 2.5 out of 5 by 10. Rated 4 out of 5 by 3bJeep from Nice screen door. Poor instructions I bought this screen door a month and a half ago. I like the fact that it moves like a patio sliding screen door (i.e. it doesn't have to be latched in the closed position to hold it there. It will stay partially open if you want it that way.) Fairly unobtrusive when installed and opens and closes smoothly so far. My biggest complaint is the poor instructions. When I pre-read them they all seemed to make sense and were easy to follow. When I began assembling/installing the door it felt like a few key items were missing or not obvious. The customer service rep suggested watching the video on YouTube would explain it better. The video was good but still didn't help. It took me about an hour and a half to get the installation completed. Once I finished the installation then the instructions made more sense and I could now install a second one in about twenty minutes. The temporary "squaring brackets" I found impossible to install properly. I understood what was supposed to happen, but I couldn't seem to make them snap into place. Eventually I got one to snap into place, but the other one never would. The "Slide Control" has been released from the end of the track several times (causing the screen door to want to retract and not stay closed). It was easily re-engaged, but it seems like it shouldn't release on it's own. The instructions say that the tension of the spring on the door can be adjusted but written instructions are useless. There is a good YouTube video of how to adjust the spring tension, but it can only be adjusted if the screen mounting plate is attached to the right door jamb (opens to the right). If the mounting plate is on the left door jamb then the adjustment screw is on the bottom of the door and it is too close to the ground to be able to adjust it. This isn't explained anywhere other than that the YouTube video which is very hard to find. The web address given in the instructions doesn't work. They give you a QR code to scan...but you have to be able to scan QR codes to use it (obviously). Seems like a good product but some more thought should be put into the instructions. Rated 1 out of 5 by Nanberry from Poor quality Have not been able to use as the screen came out of the mounting immediately. Rated 4 out of 5 by Korsey from Worked great the first summer We loved our door and used it all the time last summer with no issues. Having trouble retracting this year. Rated 5 out of 5 by tazz from Worth Buying have it about a month now, works great, took a while to read the instructions sheet in which is not the best poor pictures. But the overall of it when its close it's not in the way of opening and closing the main door. It's install indoors it can stay up all year around. Rated 5 out of 5 by Cybersombosis from Works perfectly if you install it properly At first I wasn't happy with the install as I couldn't figure out how to make it so the handle will stop right where you want it to. I thought there would be enough friction to make it work like the video but alas I had to buy magnets to hold the door closed. The instructions never told you how to enable the strings that are attached to the handle to provide counter tension as you close and open the door. After my son happened to knock the bottom off during the first use of the season, there was a spring mechanism in the handle which wasn't being used. There is a little notch on the end connectors that snap to the string to provide the counterbalance that I was looking for from the beginning. Now that I have them installed properly, it is working exactly the way I wanted it to. Full control of the door with no slamming open. If I only want to move it an inch, it will stay exactly where you want it to. If you want to open it just 1 foot to go outside, you can and it will stay right where you want it to without having to hang on to the handle with zero chance of slamming. One of my pet peeves with other units. I've now installed 4 of these screen doors and will be buying one more for my Mom. The fit and finish of this unit along with the innovative screws and hardware are great to work with. I would highly recommend this screen door for the handy person. Will this fit a double door opening?